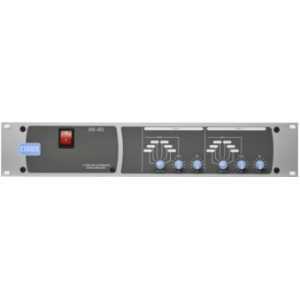 Multi-Zone Mixer Amplifiers - Akwil Ltd.
Multi-Zone Mixer Amplifiers There are 6 products. The 46-120T Media 4-Zone Integrated Mixer Amplifier provides individual source selection and volume control of up to six audio sources and two microphone inputs across four zones. Each zone is provided with 120W (4ohm) output or 120W (70/100V) output with internal transformer modules pre-installed. The 46-50 offers simple, direct connection of two microphones and six music sources which can be routed to feed four different output zones with up to 50W of clean audio power. The 46-50's music programme and level can be controlled remotely. The 46-120 4-Zone Integrated Mixer Amplifier offers simple direct connection of two microphones and six music sources which can be routed to feed four different output zones with up to 120W (4ohm or 70V/100V with optional internal transformer modules) of clean audio power per zone. The 46-120Media 4-Zone Integrated Mixer Amplifier offers simple direct connection of two microphones and six music sources which can be routed to feed four different output zones with up to 120W (4ohm or 70V/100V with optional internal transformer modules) of clean audio power per zone. Do you have a question about one or more of our Multi-Zone Mixer Amplifiers products? Click below to contact us.